On the way to Palma by car, we got to take a good look at the port of Palma and the yacht club harbor along the route. The day was sunny and the sea looks magnificent. It is very blue, tiny whitecaps, and dotted with sail boats. We aimed for the parking lot just beneath La Seu (The cathedral) but the line of cars waiting to get in was backed up indefinitely, so we passed La Seu and turned up the “avenues” where we easily found a parking lot with space. A turn to the right from the parking exit headed us straight into a street lined with prostitutes so we turned left and went around. Off the boulevard the area was pretty seedy (though without working girls) but it was also full of shoppers (Carrer des Sindicat). Neither the stores nor the shoppers were the high end we would see later in the day along the Passeig de Born, but people-watching revealed much of the wonder of the grand diversity of humanity. 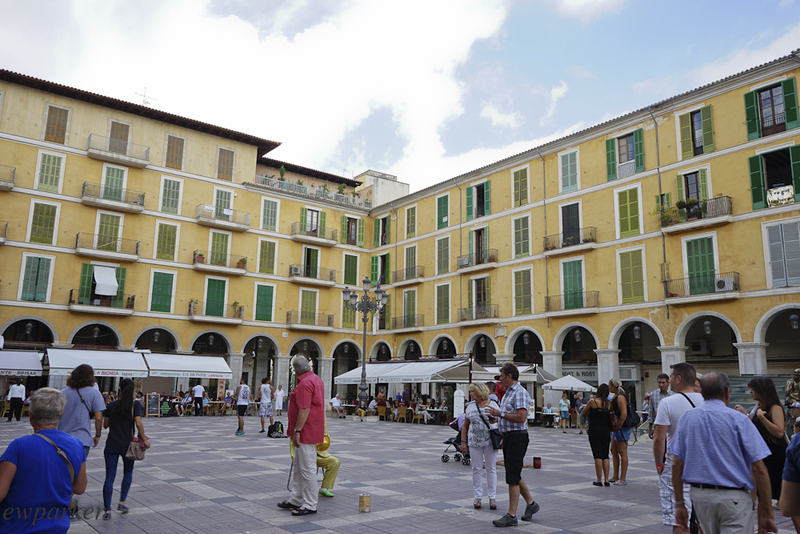 Palma is a city to discover on foot. The center is not so large that you can get seriously lost, and each corner turned reveals something interesting, if not merely curious. On a Friday morning the streets were full of shoppers and strollers, perhaps more people than would have been strictly necessary for the proper enjoyment of street strolling, but I am sure that it is far emptier than it would be mid-summer and I consoled myself with this thought and move on to just enjoying the shops and the plazas and the buildings. The buildings in Palma are beautiful. Many have Art Noveau touches, and many have windowed balconies (I don’t know how else to describe them) that I am told help to hold in the sun’s warmth in the winter. They remind me of conservatories. We wended our way to the Plaza Major, a happy place ringed by yellow buildings and restaurants. There were artisan booths set up in the center and, of course, there are street performers. I spotted a headless man, a man seated in levitation about 4 feet off the ground, and another figure painted bronze who really did look like he could have been a statue. Even as we left the plaza we saw a woman dressed in a very old fashioned, multi-tiered ruffled skirt and another man dressed as a centurion. The cafes were filling. It was almost lunchtime (already lunchtime for tourists). 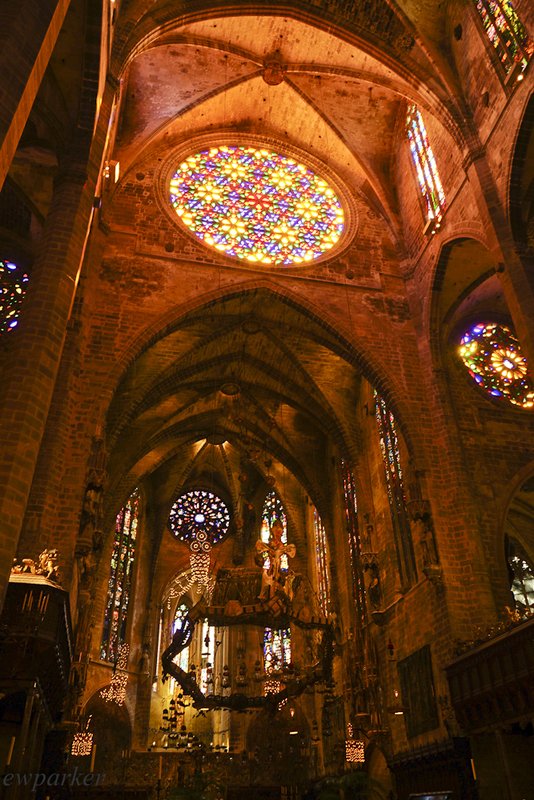 La Seu (interior) in Palma – the metal guardrails in the foreground were also made by Gaudi. We finally found ourselves at the cathedral and decided to visit, thinking it might close at 1. I disdained the free audio-guide but took it nonetheless, and to my delight, found it quite instructional as I walked through the nave, apse and side aisles of the immense building (second largest Gothic cathedral in the world). I found all the touches by Antoni Gaudí to be wonderful, neither like nor unlike those of La Sagrada Familia in Barcelona, but totally original – an earlier style, no doubt. I also took a longer look at the chapel by Miquel Barceló. What seems borderline sinister at first glance, was revealed by the audio-guide to be mere whimsy in Barceló’s hands as he interprets the meaning of the holy sacrament of communion. 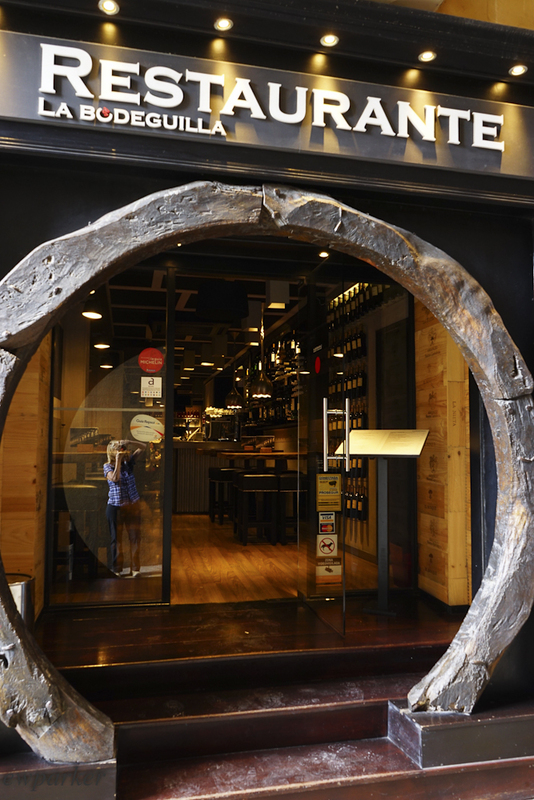 You certainly would not want to leave with the wrong impression! The cathedral is worthy of a long, slow visit. 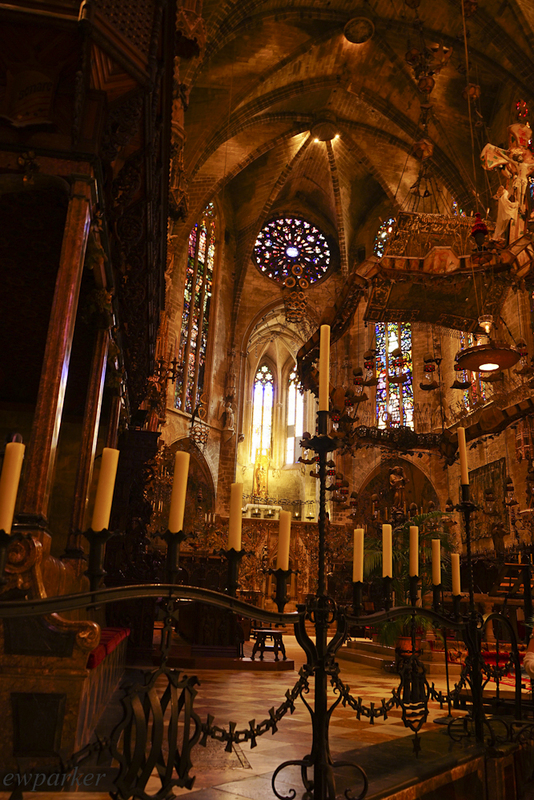 There is so much to see and the decoration so different from what you might expect in a Gothic church. We had seen it before so a good listen to the audio-guide was sufficient, and even so we were easily there for 45 – 60 minutes. We by-passed the front of the cathedral for today and went in search of a recommended lunch restaurant, which unfortunately, and unforeseen, was closed. Instead we settled on a interesting looking place called La Bodeguilla where two tapas (crab terrine and sautéed seasonal mushrooms with artichokes) and a split portion of creamy rice with duck were all excellent. I had a glass of very good Mallorcan white wine. 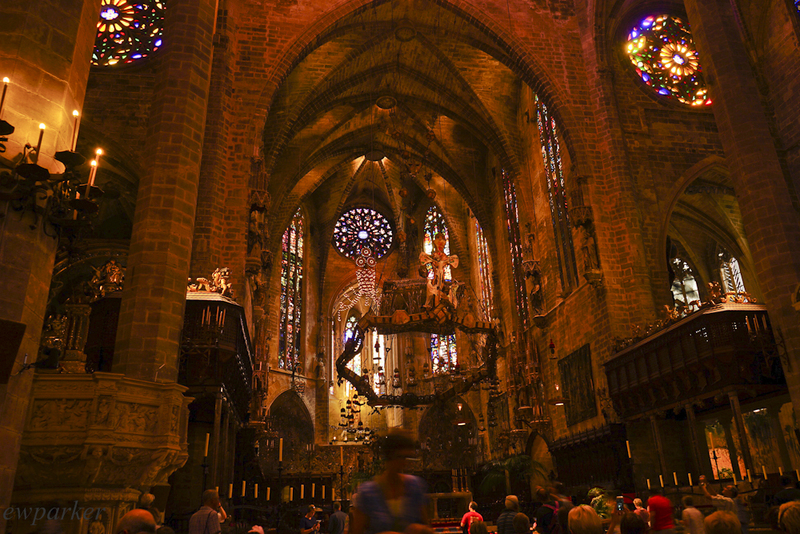 Our basic plan was to save sightseeing in Palma for an evening – my memories are that it is quite magical in the evening – so for the post prandial activity we decided to go looking for the glass factory. Despite the roundabout way we took to get there (our map is almost as badly marked as the roads themselves!) the town of Algaida and the Gordiola Glass Factory are probably less than 10 minutes east of Palma. The factory is located in what looks like a medieval castle – and maybe it was because the Gordiolas have been making glass since 1719, maybe right there in that building! There is no guided tour, but there is a lot to see and you can wander around at will to see it all. And there is time to see it because, being a weekday, the place closes at 7:00pm. First, I spent time down in the pit of activity where there were 3 master glass makers and three assistants at work. I would have loved to know if one or more of the workers were a descendent of the Gordiola family. A perusal of the museum, which is up on a second floor accessible from a courtyard outside the big workroom, revealed the history of the glass-making family, and included examples of the work of the masters from each generation. It was fascinating to uncover the history bit by bit. I stumbled upon a room in which there were actually paintings of the worthies – and surprisingly each one looked pretty normal, unlike the rather bohemian crowd currently at work below. Much of the upstairs display was also historic, ranging from ancient times to modern, and literally from all over the world. Interesting as it is, the museum could do with a serious curation effort as the wonderful items on display deserve greater attention. Of course, no self- respecting glass factory would be without a showroom and the chance to shop. The showroom here was at least three enormous rooms full of wares for sale. Everything was quite expensive, but what made shopping difficult was the sheer number of items from which to choose. I left without buying anything, because besides being unable to make a decision, trying to transport my fragile purchase for another two weeks around Europe before going home dampened my enthusiasm. 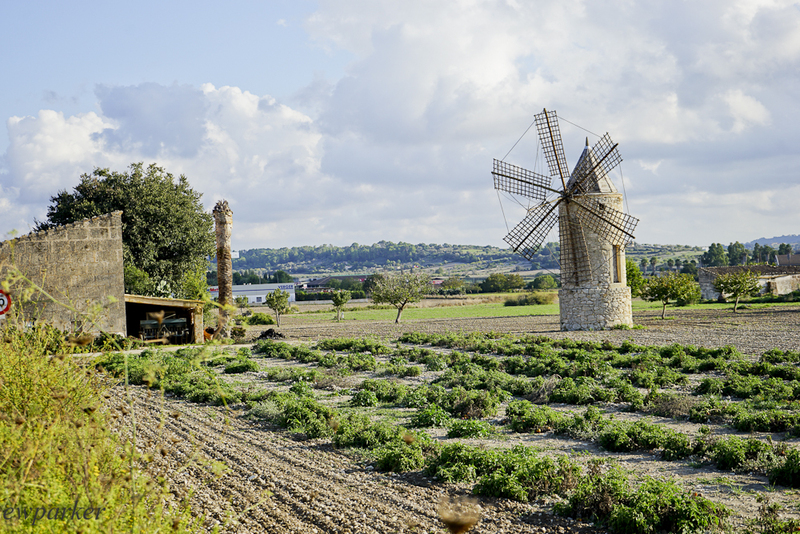 After the glass factory, we drove eastward to the village of Montuiri, where we were supposed to find extant windmills. We got caught in a warren of extremely narrow streets that all threatened to be two-way without seeing a single windmill. Spit out of the town and its narrow alleys, we drove around the outskirts, through farms that were lovely and picturesque. Spotting a windmill or two we honed in on one, and when we found it, discovered an archeology museum! Unfortunately it was closed already, but we were able to scale the building and get some good photos of the windmill (here in Mallorca used for pumping water) all with the lovely musical accompaniment of tinkling sheep bells. Back on the highway, we drove west, past Palma, past our hotel, all the way to Port d’Andratx where we hoped to, and did in fact, catch the sunset and had a good dinner right on the cay.